If you have a business idea right now, do you really know your customers? 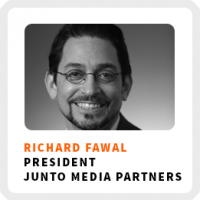 Richard Fawal believes the process for creating content that converts into customers starts by knowing the needs of your audience. He’s an expert on understanding audience needs. He’s spent the early part of his career working on political campaigns and even owned a political consultancy along the way. Now he’s the president of Junto Media Partners, a consultancy that creates storytelling opportunities for trade organizations, small businesses and nonprofits using podcasts. Be willing to be wrong and to experiment. Maintain your motivation by thinking of life as continual opportunities to learn. How to figure out which opportunities to chase and which to let go. Core work activities + habits: 1) Sales. 2) Creating quality content. 3) Thinking about what he’s missing. Regains focus by: Finding a diversion and getting away from the work for a little bit. 90-day goal: Get three new contracts. Include negatives from your story, like mistakes you’ve made, to add context for what has and hasn’t worked.